Joe Blogs: Reading and commenting on feeds never felt so good! Reading and commenting on feeds never felt so good! Image by Thomas Hawk via FlickrMy FriendFeed activity has increased a lot recently and it is the place I check firstly for information now. 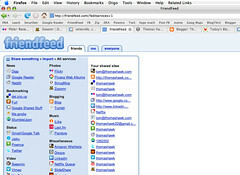 Google Reader still contains the bulk of my feeds but I check FriendFeed first due to the people I am subscribed to there. Namely people like Robert Scoble and Louis Gray who are heavily active there and are providing a lot of great blog posts and stories from their own sites and also information they come across and share. I am not subscribed to anywhere near as many people as them but FriendFeed makes suggestions of people it recommends I should follow and so far it's been quite accurate so my subscriber list is increasing in size. I consider myself involved in a decent community as the content I read there is rich and meaningful. The team behind the site are great as well, for example today Google Reader launched the ability to add Notes. Shortly after FriendFeed enabled the Notes to be visible through the site, I was also able to edit my Notes from there as well. Innovation, definitely and moving in the right direction I believe so as well and at the moment it's ticking all the right boxes. With Alert Thingy, Twhirl and a few more we are able to access the information by means of a messenger type service and this is definitely broadening appeal and making the content more readily available. I'll be sticking around for a while yet as it's the place to be!